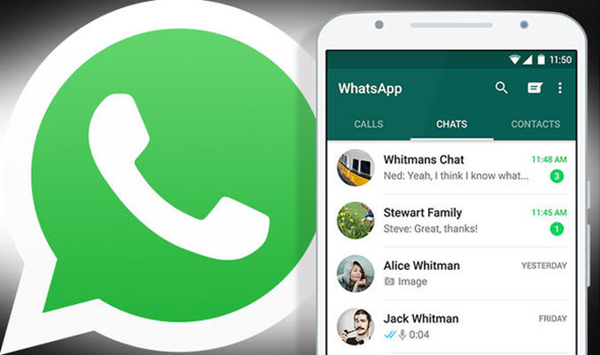 WhatsApp is a cross-platform instant messaging app for smartphones that has become a trend leader in the communications industry with its multi-functional user interface. It uses the Internet to send messages, which cost significantly less than text messaging. The app offers a plethora of features, including group chat, voice messaging, location sharing, etc. And, just go into WhatsApp website by scanning the QR code, you can also access it from the desktop. This app is popular among teenagers and people of all age groups alike. Owned by Facebook, it currently has 1 billion users worldwide. Probably the best feature of WhatsApp is that it allows users to keep in touch with people living in international countries, without incurring the international charges associated with text messages. Off late, people have been using WhatsApp as a medium to share important items like agendas for the week, timetables, monthly schedules, work plans and assignments. Largely, corporate houses, educational institutions and government bodies have been using WhatsApp to share important information. In this scenario, it is understandable how much important it is to protect WhatsApp chat history by performing regular backups. Here, you might want to know how to backup WhatsApp messages. No worries! Next, we will explain the procedure with step-by-step guidance. Fortunately, WhatsApp backs up automatically and saves your messages to your phone’s memory on a regular basis. However, depending on your settings, you can also back up WhatsApp chats to iCould Drive or Google Drive. WhatsApp chat history is not stored on the iOS server. 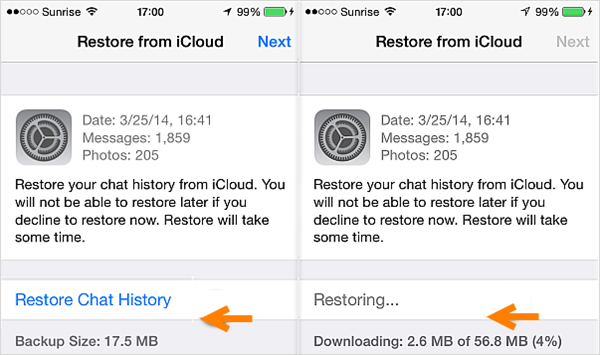 But you can use the iCloud backup feature to back up and restore chat history on iPhone. It is quite easy and you can do it without any problems. Step 1. Sign in your Apple ID and enable iCoud Drive. Then back to the Home screen. Step 2. Launch WhatsApp, tap on Settings > Chats > Chat Backup > Auto Backup. Step 3. After that, set whether it is daily, weekly, monthly or never automatic backup. For Android users, you can back up WhatsApp chats to Google Drive. This way, just for instance, you want to uninstall WhatsApp from your phone, your messages will not be lost. Be sure to back up the data before you uninstall the application. Google Drive is a great way to backup all your WhatsApp messages. You can switch from one Android phone to another, and you’ll be able to access your chats and media wherever you go. This is also a bit of extra insurance, in case WhatsApp crashes for some reason and can’t be fixed, you will eventually have to uninstall and reinstall it. Step 1. Launch WhatsApp from your home screen or from the app drawer. Step 2. Tap the Menu icon on the top right of the screen, then click Settings > Chats > Chat Backup > Back up to Google Drive, then set a backup frequency. Step 3. Sign in to your Google Account that you use to backup your chat history. Step 4. Tap Back up over and select the network you want to use for backup. 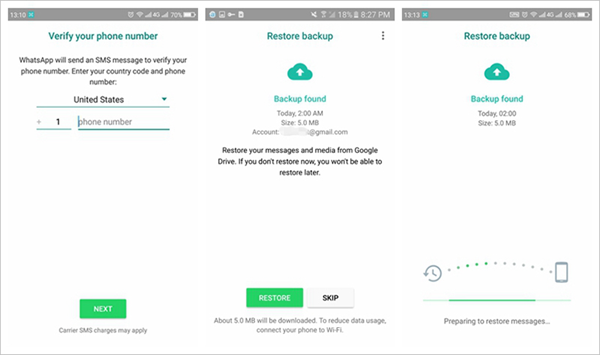 Now that all data is backed up and safe, you’ll be able to restore your chats every time you reinstall WhatsApp no matter what the device you use. Step 1. 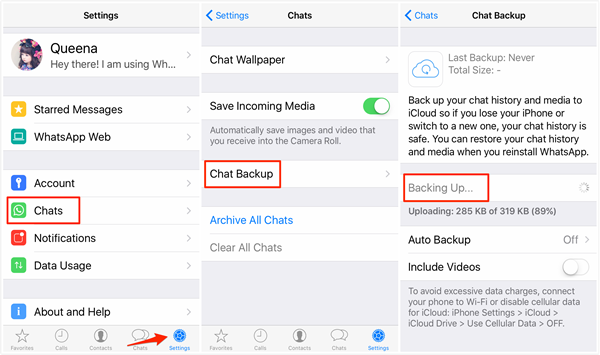 Run WhatsApp on your phone, go to Settings > Chats > Chat Backup to check if there is an iCould backup or not. Step 2. If yes, uninstall and reinstall the WhatsApp app from the App Store. Step 3. After running, verify the your phone number and select restore from iCould Backup, then follow the on-screen prompts to restore your chat history. Everything is backed up. Fantastic! You’ve changed your phone or have had to reinstall WhatsApp. But things are not good. Now how do you get all your chats back? Uninstall and reinstall WhatsApp on your phone. Launch it and verify your phone number when prompted. Select recover your chats and media from Google Drive. Then tap Restore. After the process is complete, click Next, your previous chats will be displayed once initialization is finished. 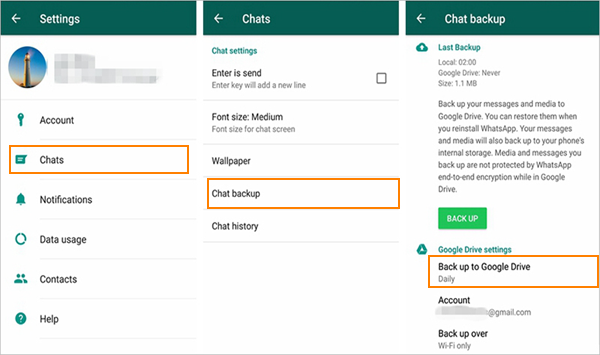 Note: If there are not any previous backups from Google Drive, WhatsApp will automatically restore chats from your local backup files. Your phone will store up to a week’s worth of local backup files. Google Drive will only have the most recent one. If you want to get a local backup for your phone, you’ll need to transfer the files to the new phone using a computer, file explorer or SD Card. Step 1. Download the file manager app. Step 2. In the file manager app, navigate to SD card/WhatsApp/Databases. If your data isn’t stored on the SD card, you might want to check “internal storage” or “main storage” instead of SD card. Step 3. Rename the backup file you want to restore from msgstore-YYYY-MM-DD.1.db.crypt12 to msgstore.db.crypt12. It’s possible that an earlier backup may be on an earlier protocol, such as crypt9 or crypt10. Do not change the number of the crypt extension. Step 4. Uninstall and reinstall WhatsApp. Step 5. Tap RESTORE when prompted. With a backup, you can easily restore your conversations. What if there are no backups available? Never mind! Gihosoft Free Android Data Recovery Software can do you a favor. It is a professional data recovery software with excellent scanning technology and powerful anti-delete capabilities, which allows users to restore deleted files without backup. Its support is provided for numerous types of files, such as contacts, messages, call logs, photos, music, videos, WhatsApp and Viber chat history, etc. 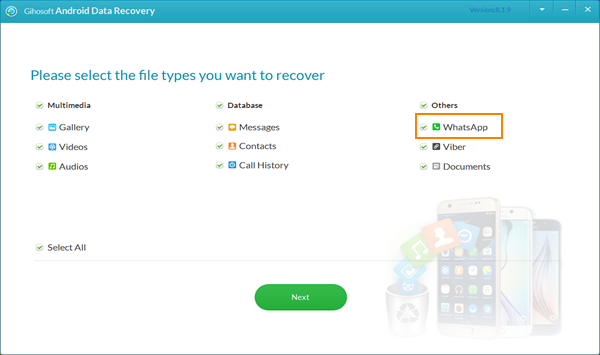 Backup and restore WhatsApp chat history is quite easy, right? If you know more methods, please leave a message below; if you find this article worth reading, please share it with your friends and family. Thanks for your time.